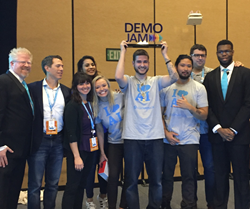 Industry-Leading Conversational AI Company Wins Salesforce Mega Demo Jam Competition This Week. While our demo team really rocked it at Dreamforce 17, we owe our victory to all of the Conversica employees who made this success possible. Conversica, the leader in conversational AI for business, announced having won the Salesforce Mega Demo Jam competition yesterday at Dreamforce 17. Of the thousands of apps on the Salesforce AppExchange and of those select few invited to compete at this year's marquee event, Conversica's AI Sales Assistant was recognized by the most important judges – Salesforce users – as the best. "The Demo Jam was tough—we faced stiff competition and prevailed in the semi-finals and then really had to bring our 'A' game for the final Mega round. Every competitor's product was a clear winner, so we are especially honored to take home the trophy," said Carl Landers, CMO of Conversica. "While our demo team really rocked it at Dreamforce 17, we owe our victory to all of the Conversica employees who made this success possible." As Demo Jam judges observed, Conversica's AI Sales Assistant follows up with leads and contacts from CRM and marketing automation systems like Salesforce. The assistants use a combination of natural language processing and machine learning to engage incoming leads in natural, human-like conversations to qualify them for sales. Salespeople, freed from the time-consuming task of contacting and qualifying leads, can better invest their time advancing and closing opportunities—and can do so using Salesforce Einstein’s complementary AI capabilities, including proactive notifications, predictive scoring and task automation.